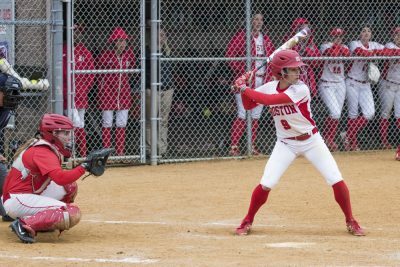 Six wins in six games over the past weekend in the impromptu Nor’easter Invitational saw the Boston University women’s softball team raise its win percentage to .533 and push its record to 16-14. BU head coach Ashley Waters’ Terriers have now won eight in a row after a disappointing first few tournaments, and will look to continue this stretch as they enter Patriot League play. BU started the Nor’easter Invitational — which was put together after the Terriers’ games against the University of Maine and Manhattan College were cancelled — in West Hartford, Connecticut with a doubleheader against the University of Hartford. The Terriers beat the Hawks (5-10) 10-5 and 8-6 in eight innings on Friday. Freshman pitcher Ali Dubois grabbed a win in game one and sophomore pitcher Kali Magane secured victory for BU in game two. Game three against Iona College took only an hour and 17 minutes, as the Terriers mercy ruled the Gaels (8-12) Saturday afternoon. Another Dubois win saw junior infielder Madi Killebrew hit a two-run RBI triple and junior catcher Alex Heinen reach home plate twice. Iona avoided the no-hitter with a two-out single in the fourth, but Dubois tallied five strikeouts in the 8-0 shutout win. Waters had high praise for Heinen after her rough start to the season. BU now owns a 5-0 all-time record against the Gaels and improved to 8-4 against its following opponent, Bryant University. The Terriers’ picked up their fourth win of the tournament after a dominating 10-1 victory over the Bulldogs (6-17). Dubois picked up her third win of the weekend, an impressive tally for the Torrington, Connecticut native. Seven runs in the bottom of the fourth and a three RBI performance from senior infielder Kaitlin Sahlinger was enough support for Dubois to pick up her eighth win of the season. Waters had high praise for her team’s strong overall performance over the weekend. Games five and six were closer games than the previous four, with a 4-2 win over nine innings in the Terriers’ rematch against Iona and a 6-2 win over Central Connecticut State University Sunday afternoon. Heinen would be a difference maker defensively in the rematch against Iona. Heinen tagged out the potential game-winning run at home off a throw from senior outfielder Emma Wong, who then hit a go-ahead two-run home run the following inning. Against Central Connecticut State (9-14), the Terriers jumped out to a 2-0 lead in the first before extending it to 5-0 in the third. Senior infielder Brittany Younan had three hits, as did senior infielder and outfielder Jilee Schanda, who also had three RBIs. Dubois collected both wins by striking out 12 hitters in a combined 10.2 innings of work while allowing just two runs. While weather cancelled BU’s home opener, the Terriers will now take on Boston College Wednesday before Patriot League play begins this Saturday against the United States Military Academy.